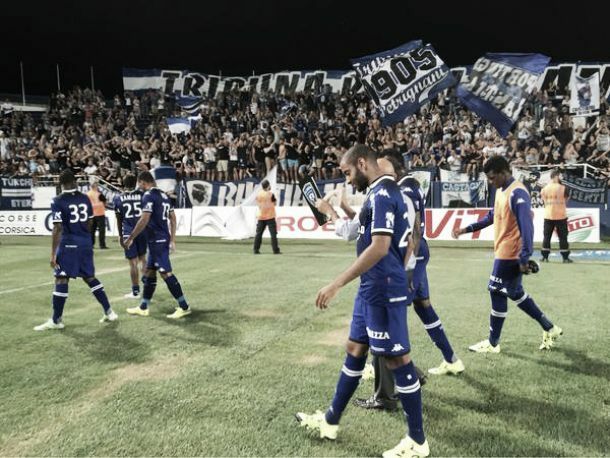 10 men Bastia defeated Rennes in the first game of the 2015/16 French Ligue 1 season. SC Bastia: (4-3-3) Leca; Modesto, Squillaci, Djiku, Palmieri; Fofana Diallo (Danic 70'), Cahuzac; Kamano, Brandao, Ayite (Maboulou 86'). Stade Rennais: (5-4-1) Costil; Moreira, Mendes, Mexer, Armand, Baal (Toivonen 74'); Doucoure (Lenjani 13'), Fernandes, Sylla, Henrique (Grosicki 67'); Sio. SCORE: 0-1, Sio 39'. 1-1, Ayite 50'. 2-1, Kamano 69'. REFEREE: Sebastien Moreira. Booked: Sio (90+3'). Sent-off: Brandao (78'). SC Bastia managed to hold on after going down to ten men to defeat Stade Rennais in the first Ligue 1 game of the season. Former Bastia striker, Giovanni Sio opened the scoring for his new team before Floyd Ayite equalised and Francois Kamano scored the winning goal. Then, 12 minutes before the end, Brandao was red carded for a late challenge on Pedro Mendes. The first half was tedious as both teams tried to work each other out with little in the way of chances. Abdoulaye Doucoure's early injury ate up some time and had to be replaced due to a suspected dislocated shoulder. The home side got the first sniff at a scoring opportunity through Brandão. The striker controlled a pin-point cross into the box and maneuvered himself to find a shot that was inches wide of the mark. The game was injected with some life when Rennes went ahead through new signing, Giovanni Sio. The former Bastia man nodded Ludovic Baal's dangerous cross home from the edge of the six yard box. Sio did not celebrate in respect to his former team. The second half was a more lively affair but not by much. Pedro Henrique pulled off a speculative overhead kick just after the restart, but it was collected by Bastia 'keeper, Jean-Louis Leca. Soon after, the hosts were back in the game as they drew level from a Floyd Ayité goal. Former Rennes man, Sadio Diallo, crossed into six yard area and it was met by the out-stretched leg of Ayité to score. Bastia began to show their dominance as they had more spells of possession and opportunities in front of goal. They finally went in front when François Kamano slotted home. A stramash in the box gave Kamano the chance to smash his effort past Benoit Costil and into the net. Rennes, devoid of ideas, brought on Ola Toivonen to try and salvage a late point from the game. Their hopes were boosted when Brandão was sent off for a late foul on Pedro Mendes. The striker had no complaints and walked off the field. Rennes didn't do enough to take advantage of the 10 man Corsicans. Their best attempt was through the substitute Toivonen when he picked up the ball outside the box from a bad touch from the defender. The Swede's volley wasn't effective and was collected by Leca. Next week Bastia travel to Brittany to take on Lorient, while Rennes host Montpellier.